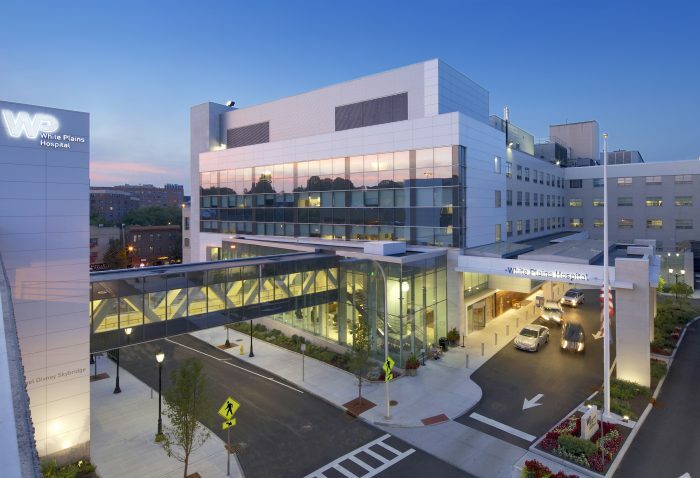 A renovation of White Plains Hospital, a 123-year-old healthcare facility north of Manhattan, featured the construction of the new, steel-framed, six-story Center for Cancer Care. Long-span high-performing composite slabs were designed to support heavy booms over operating rooms and limit vibration that could adversely affect hospital occupants. 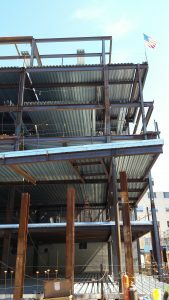 The architectural and engineering teams worked in collaboration with the steel and deck fabricator early on in the project lifecycle to take a fresh look at building design, floor by floor. The plans featured two alternating floor systems to answer the unique design objectives of the project—objectives that were structural, functional and cost accountable. The plans for this special-use building called for different composite flooring systems on alternating stories to address specific needs of the office/patient room floors and state-of-the-art operating room floors. As such, vibration control also would have to be varied by floor. The operating room floor at level 3 and patient room floors at levels 5 and 7 used a steel girder and filler beam system supporting 3-inch-deep standard composite floor deck topped with 5¼-inch and 3¼-inch regular-weight concrete, respectively. Then a long-span Versa-Floor system, consisting of 7.5-inch Deep-Dek Composite topped with 5⅜-inch concrete and supported by steel beams spanning 25 feet 6 inches, was used for the office and patient room floors at levels 2, 4 and 6. Because the Versa-Floor Deep-Dek Composite system eliminated filler beams, the floor system height could be reduced while accommodating MEP requirements. A 13-inch-deep composite floor system addressed strength, openness and vibration-control challenges. The slabs were designed for a superimposed dead load of 25 pounds-force per square foot (psf) and a live load varying from 40-100 psf for the slabs with different occupancy types. The 4th-floor slab above the operating rooms supports two light booms and two equipment booms in addition to the uniform design loads. These booms weigh 400 and 2,067 pounds, respectively, and apply concentrated bending moments of 1,500 foot-pounds and 9,220 foot-pounds, respectively, to the slabs in any direction. The boom manufacturer requires the maximum angular deflection of the slab not to exceed 1/3 degrees from level. Composite deck, which acts as external reinforcement of the composite slabs, provides sufficient moment capacities of the slabs in the direction parallel to the deck span. In the slab areas affected by the operating room booms, two layers of reinforcing bars were provided in the concrete cover above the deck, perpendicular to the deck span, to resist the boom-induced bending moments in the direction orthogonal to the deck span. The AISC Design Guide 11 provides basic principles and simple analytical tools to evaluate vibration serviceability of steel-framed floors subjected to human activity. These tools are applicable to floor systems with intermediate beams as well as concrete slabs on conventional composite floor decking in which the depth isn’t greater than 3 inches. Composite slab stiffness is not taken into consideration in the simplified analysis, which is based only on the flexural stiffness of the girders and beams. For the White Plains Hospital, a standard composite floor system supports operating room floors, while the floor in this picture employs a Versa-Floor Deep-Dek Composite system whose underside created an uninterrupted ceiling plane above the operating rooms. In the simple vibration analysis, the conventional composite slabs are considered an additional mass supported by the beams and girders. 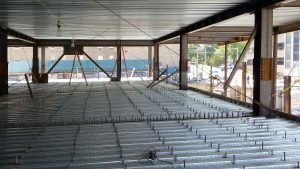 Due to the relatively short spans of conventional composite slabs, such an approach has been shown to be appropriate for floors with regular framing and uniform mass distribution. Intermediate beams typically are not used in long-span composite floor systems; the slabs bear directly on girders. Therefore, in the case of this project, slab stiffness had to be taken into account in the vibration analysis of floors with long-spanning slabs. Dr. Thomas Murray, emeritus professor of steel design at Virginia Tech as well as a leading expert in the field of floor vibration and the first author of AISC Design Guide 11, performed an extensive study on the vibration of long-span composite slabs formed on the steel decking engineered and manufactured by the project’s steel-deck provider. This study included several tests of floors in real buildings and full-scale laboratory mockups, allowing Murray to develop a simplified analysis method applicable to long-span slabs without intermediate beams, which has been successfully used on many projects with regular framing. However, the simplified vibration analysis method developed by Murray isn’t applicable to cantilevered floors, so a detailed finite-element vibration analysis of the long-span floor system was performed. 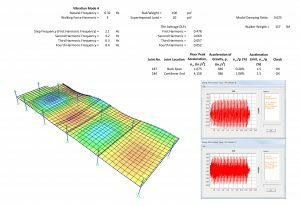 For this project, general-purpose structural software, SAP2000, was used to perform a time-history analysis to predict vibration of the long-span floor system. The slabs were modeled using orthotropic shell elements with different flexural stiffnesses in the directions parallel and perpendicular to the deck span. The flexural stiffnesses of the shells were computed using the uncracked moment of inertia of the slab and the dynamic elastic modulus of concrete, in accordance with AISC Design Guide 11. Iterative vibration studies helped uncover areas that needed reinforcement to avoid floor vibration. Three-dimensional frame elements were used to model the White Plains’ beams and columns supporting the slabs. Beams were modeled as fully composite with the slab, while columns extended to the mid-heights of the stories below and above the floor, assuming that the columns’ points of contraflexure are located at midpoints of the columns. The self-weight of the floor system and a portion of the superimposed uniform load (which represented an estimate of expected day-to-day loads) were applied to the slab shells as uniform mass. The 2nd floor was designed using the damping ratio of 0.025 of critical damping to meet the acceleration limit of 1.5 percent of the acceleration of gravity. The 4th and 6th floors were designed using the damping ratio of 0.04 of critical damping to meet a more-stringent acceleration limit of 0.5 percent of the acceleration of gravity. The different acceleration limits and damping ratios were used due to the floors’ different occupancy types and amounts of non-structural elements that dissipate energy. Natural frequencies and mode shapes were computed using the eigenvalue analysis, where all vibration modes with frequencies smaller than 9 Hz were considered. The load representing a walking person was idealized as a Fourier series and applied to the back span and cantilever nodes of the slab model with the greatest displacements for each considered vibration mode. The performed analyses showed that some floor areas near the slab cantilever end may have been susceptible to annoying vibrations. The structural engineer of record proposed the installation of steel struts connecting the long-span slab cantilever ends with the floor above. Repeated vibration analyses of the floors with the added struts predicted floor accelerations smaller than the acceleration limits. This advanced vibration study and the decision to alternate the flooring systems to meet the specific needs of each story demonstrate that early stage collaboration among engineers, architects and steel fabricators helps solve complex performance, cost and space-planning challenges. At the project’s conclusion, White Plains Hospital was named one of Soliant Health’s “20 Most Beautiful Hospitals in the U.S.” in 2016. Kenny Lapins is a senior writer for New Millennium Building Systems; email: kenny.lapins@centrifuge-now.com.